Now you can have an Ultrak 310 Sports Stopwatch for every and any occasion. This pack of Ultrak 310s have all the quality features of the 310 but with vibrant rainbow colors, so you can show express yourself while keeping healthy and organized. What more could you want with such a great deal! 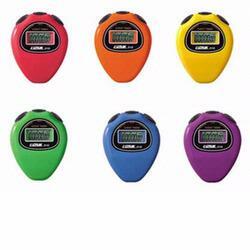 The Ultrak 310 is a simple event timer that is ideal for students, volunteers and other occasional timers! All other entry-level stopwatches (pick a brand) include a mode that takes users out of the stopwatch function and into time, date, alarm, etc. This has the potential for throwing those who seldom use a stopwatch for a loop, particularly event volunteers. The 310 was built specifically for infrequent timers like volunteers and students.